Author: Siegfried Passarge. Translated by: Edwin N. Wilmsen, Leander Gloversmith, Caroline Jeannerat, Klaus Keuthmann. Edited by: Edwin N. Wilmsen. Series edited by: Rainer Voßen. 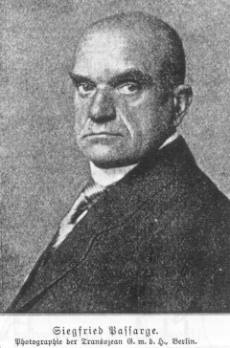 Siegfried Passarge is justly esteemed for his pioneering work in physical geography and is considered to be a pioneer of modern geography. Less appreciated is the fact that he also wrote two of the earliest ethnographic monographs based on what, after Malinowski, came to be called “participant observation”. These are Die Buschmänner der Kalahari (originally published in 1905) and Das Okavangosumpfland und seine Bewohner (also 1905); he also published a short ethnographic sketch on the Hambukushu as well as journal accounts of his fieldwork. An essay in which was presented the theoretical foundation of his Kalahari work is recognisable as an early statement of cultural ecology. All these works are presented for the first time in English. For their historical value alone they are of interest to anyone concerned with the peoples of southern Africa. Isaac Schapera replied heavily on Passarge for his encyclopedic synthesis The Khoisan-speaking peoples of South Africa, the anthropological reference on these peoples into the 1960s. Indirectly, then, Passarge is a primary source for the view of “Bushmen” as it was at mid-twentieth century. Although, by today’s standards, Passarge did not give a complete description of any Khoisan, or Bantu, people’s social-cultural life, his monographs are packed with ethnographical, ecological, and historical information of high quality. Much of this detail substantiates more recent ethnographic work and enriches it with over half a century of observational time depth. Passarge’s texts, however, contradict the substantive interpretations of later ethnographies; if his publications had been readily available these ethnographies could not have been written as they are. Passarge separates “The life of a Bushman family in the present” (which he observed) from “The life of Bushmen in former times” (which he reconstructed), and traces the development of socio-economic forms to historical processes acting in combination with environments. His texts, thus, illuminate the current Bushmen debate. These texts are important also for the light they shed on the discourse on human evolution and the controversy over race contested on both sides of the Atlantic during the last decades of the nineteenth and first decades of the twentieth centuries. Passarge advocated a monophyletic history of human evolution and accepted the Darwinian synthesis of the unitary descent of man then being constructed by anthropologists and biologists. He habitually introduced his discussions of current conditions with a summary of the fossil evidence for unitary human evolution and traced the development of races to processes of differentiation acting on the species. The texts, therefore, illuminate historically current debates over human evolution. Thus Passarge’s Kalahari ethnographies take on new significance nearly a century after they were written. The expedition of the British West Charterland Ltd.
Wilmsen sheds light on the importance of Passarge’s findings whose whose work was read by Schapera and Bleek and criticises that it was later on neglected by other ethnographers. 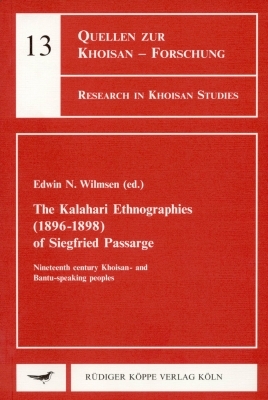 In contrast, Passarge’s ethnographies have been essential to some of Wilmsen’s arguments in the past. Here Wilmsen takes up again the Kalahari Debate and suggests that if Passarge’s information would have been more widely known and recognised by Khoisan (and other) researchers the argument would have looked differently.